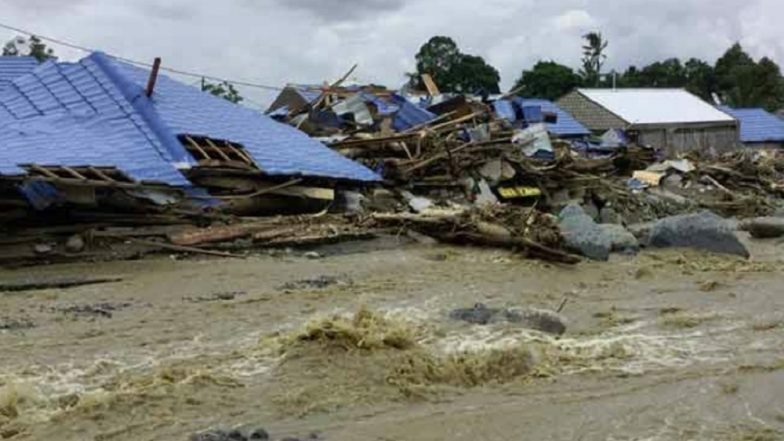 Sentani, March 27: Unidentified victims of deadly flash floods and landslides in Indonesia were buried in a mass grave Wednesday, with dozens still missing nearly two weeks after the disaster. The official death toll stands at 112, but over 90 more people are unaccounted for after torrential rains pounded Indonesia's Papua region, triggering landslides and flash floods. Some 20 victims who have yet to be identified were placed in numbered coffins and then buried near the hard-hit town of Sentani. Their DNA samples have been sent to the national police headquarters, authorities said. "If later on there's a family member who comes to report a missing relative, we will take their DNA and if it matches, the body (will) be exhumed and given to the relatives," Ramon Amiman, head of the medical unit at the Papua police, told AFP. Indonesia Flood Death Toll Tops 100, Dozens Still Missing. The March 16 disaster left nearly 1,000 injured while more than 11,000 people were evacuated to temporary shelters, with thousands still living in makeshift tents. The government earlier announced a two-week state of emergency after the disaster destroyed homes and other buildings and blocked roads. In one residential complex alone, some 60 homes were swept away. "The destruction is enormous," said Giri Wijayantoro, vice regent of Papua's capital Jayapura. "We're still in the state of emergency so we're focusing on searching for the missing victims." Flooding is common in Indonesia, especially during the rainy season which runs from October to April. In January, floods and landslides killed at least 70 people on Sulawesi island, while earlier this month hundreds in West Java province were forced to evacuate when torrential rains triggered severe flooding. The Southeast Asian archipelago of some 17,000 islands is one of the most disaster-prone nations on Earth, straddling the Pacific Ring of Fire, where tectonic plates collide. Earthquakes and volcanic eruptions are common. In December, the western part of Java island was slammed by a deadly volcano-triggered tsunami that killed about 400 people. Also last year, the city of Palu in Sulawesi was rocked by a quake-tsunami disaster that killed thousands, while hundreds of others died in a series of quakes that hit the holiday island of Lombok, next to Bali.